Hey Everyone! Hope you are all having a lovely bank holiday weekend! Today I thought that I would do another 'Share The Love' post as I didn't do one last month purely because I just had so many other ideas for blog posts so I thought I'd save it for the start of May instead. 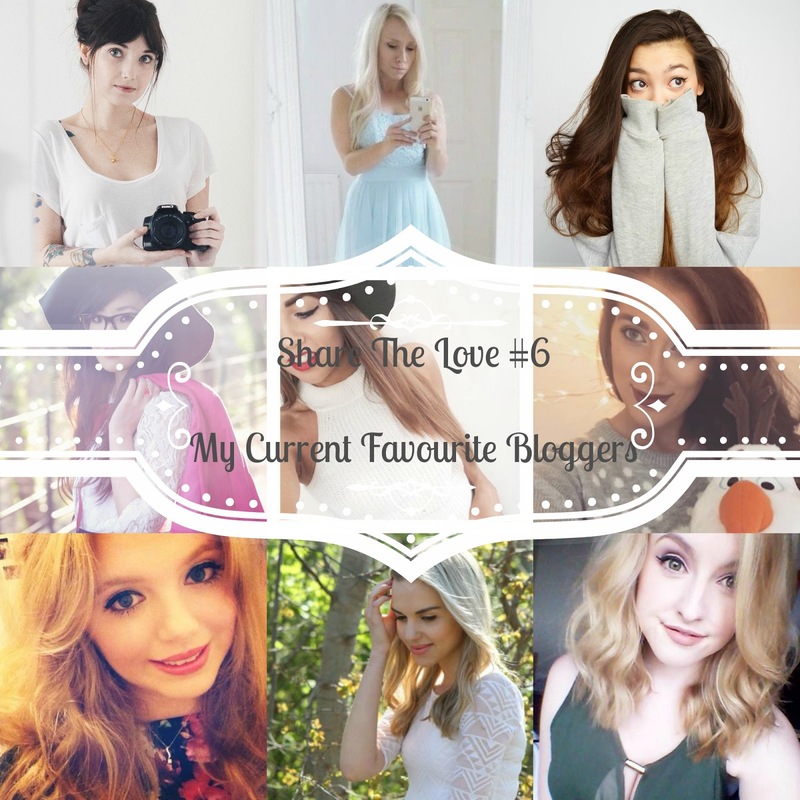 I have been reading lots of blogs over the past couple of months but these are the ones I keep going back to as I just think they are all amazing writers and absolutely lovely girls too! Keep reading to see why I love their blogs. Rebecca is the author behind 'FromRoses' and I absolutely love her blog. I think the name of her blog is so lovely and the main thing I love about her blog is her photography. Her photos are always so clear and crisp and really illustrate each post really well. I also love the fact she posts a lot of variety on her blog and there's something for everyone on there. I especially think today's blog post about 'Being The Blogger You Want To Be' is definitely a post that every blogger out there should read. Becky's blog is definitely one of my all time favourite reads. It's one of the first blogs I ever stumbled across and I just love it. Her photography is absolutely stunning, she's one of the sweetest bloggers I've ever come across and again her blog is full of variety from wishlists, to lifestyle, to recipes, you can find it all on MilkBubbleTea. I could scroll through this blog all day as the photos are just beautiful. I can't actually believe I've never included Isabella's blog in one of these posts before. Before I started to blog the lovely Gabriella (Velvetgh0st) on youtube and I were talking about the possibilities of me starting a blog. Gabriella thought I should go for it and tweeted me a video that Isabella had done giving advice to people who want to start a blog. Since then I have been absolutely hooked to her blog and videos. I just find her a really interesting person and I absolutely love her blog. Again there's a lot of variety on her blog and Isabella also has a youtube channel so make sure to head on over to watch her videos. If you're thinking about starting a blog then click HERE to watch the video she did that pushed me to start my own blog. Yes it was done a while ago but it's still very inspiring. I have been reading the lovely Sarah's blog for quite a long time now but I absolutely love her blog. I'm pretty sure I've mentioned her in a favourites post before but I absolutely love it. She always posts about things I'm interested in and I absolutely love her fashion sense and her photography. I'm sure most of you reading this are already following Temporary Secretary but if not I'd highly recommend it. Her blog is stunning. Copper Garden is a blog that I have been following for a very long time now. Even before I started my own or started to really get into my own blog. However I will be honest here and say that I haven't actually read it that often for the past 4-5 months. I came across is again at the end of March and I have been reading it consistently since. I absolutely love everything about Jess's blog from the layout, to the photography to the content. I absolutely love it and I also find her an interesting person as well, She studies fashion at university but specialises in menswear and I just find that so interesting! I'm always interested to see what she's going to be talking about over on her blog and her own fashion sense is amazing too! Jess also has a youtube channel and I've been watching that more and more too and I absolutely love her videos. Definitely one to check out if you haven't already. I think I've mentioned Sophia in a share the love post before but I can't actually remember which one. Either way I am still absolutely loving her blog. I absolutely adore the variety of content she posts and her photos are always really bright and clear on her blog which definitely attracts me more to her blog. If you haven't come across her blog before then definitely check it out. I absolutely love Kayleigh and her blog. I speak and interact with her all the time and she's definitely a blogger that I respect a lot. I love that she posts whatever she wants to on her blog, even some things that are extremely personal she writes about them purely to give advice to other people and I absolutely love that about her blog. Definitely check her out if you haven't already. She's such a lovely person! I absolutely love this girl and her blog. I think her fashion sense is amazing and I love the layout and photography on her blog too. I also love her photography as she takes photos of everything from different angles so you get a well rounded view of the products and what they look like and whether or not they are for you. I also love her fashion sense and she seems like a lovely girl too. Definitely a blog to check out if you haven't already. Aisling is a fairly new blog that I've come across in the last month or so but I absolutely love it. I love the quality of her writing and her photos and she's such a friendly person too. Again her blog is full of variety and she posts about serious topics on her blog as well which I like as some of them can be a real eye opener. Definitely a blog to check out if you haven't already. Phew, that's a lot of blogs! Hopefully there are some new ones here for you to check out if you haven't already. They are all such a lovely girls and their blogs are all amazing so definitely give them a follow and comment on their posts as I'm sure you'll make there day! Do you have a blog? Or have you started one recently? If so leave your links in the comments below and I will check them out! Hi Fleur, thank you so much for including me in your post you little sweetheart! I've been following your blog for a long time and have been following your journey. I'm so pleased that Gabriella showed you a link to the video, otherwise I wouldn't have known all the amazing things about you! Have a lovely weekend <3.